2015 Leaf Metal Draft Baseball takes a look at 2015 MLB Draft picks, top minor league players and international studs. The popular prospect-driven product returns with seven autograph per box. Featuring a variety of chromium designs, 2015 Leaf Metal Draft Baseball is an autograph-only release. 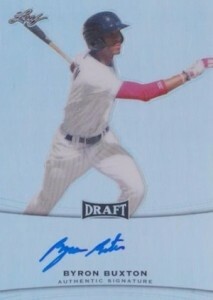 Base Draft Metal Autographs, National Pride and Top Picks are each available in base versions and limited parallels. The product will also include Perfect Game Metal Autographs which feature on-card signatures from the top prospects at the Perfect Game event. Notable options in the release include Yoan Moncada and Jameis Winston. Moncada is a top Cuban prospect with the Boston Red Sox who appears on the cusp of getting the call this year. While many collectors are familiar with Jameis Winston due to his football ability, the card featured in Leaf Metal Draft will showcase Winston from his time as a college pitcher for Florida State. Leaf offered a similar option in 2014 with signed Johnny Manziel baseball cards. 69 cards. Redemptions (R*) noted below. Jameis Winston is a Short Print limited to 50 copies. 7 cards. Redemptions (R*) noted below. 16 cards. Pick number noted below. love the hot boxes and I hit a #3/10 Green Moncada so that was nice!